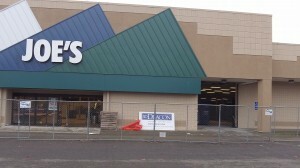 The front of the store being remodeled. At least one of Albany’s large vacant retail spaces appears to have found a new future tenant. A construction fence has gone up outside the former GI Joe’s on Southeast 14th Avenue, and workers are busy inside. One of them says they’re building an inside wall to divide the huge space. Marshalls is a discount department store that also operates under the T.J. Maxx label. The nearest Marshalls is in Salem, while T.J. Maxx has a store in Corvallis. Records at the building division say the contractor, S.D. Deacon of Portland, is redoing 23,000 square feet of the 65,000-square-foot store, with the rest being left unfinished for a “future Big Lots.” The building, by the way is owned by Yee Hop Realty in Honolulu.